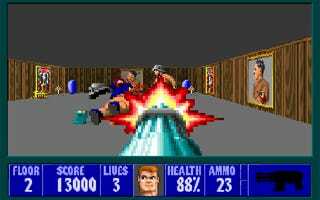 Yes, other games came before it, but that's just nitpicking: for 99% of gamers, the first-person shooter genre kicked off with Wolfenstein 3D, which turned 16 yesterday. Happy birthday! Having played through the original only a few months ago, it's funny how, sixteen years on, I still had more fun with Wolfenstein than I do with most modern FPS games. Maybe that says something about the pure, arcade pleasures of the game. Or (more likely) it says something about the appeal of mowing down a mechanised Hitler with a chaingun while stuffing your face with plates of bbq chicken.